Over the past 36 years the Comedy Cellar, located in the basement of a restaurant in New York has become known for having some of the best comics on stage. The careers of many successful comedians were launched at the Cellar such as Colin Quinn, Sarah Silverman, Amy Schumer and Chris Rock to name a few. Whether or not their specific sets get many laughs on any given night, if they have talent they're given a time slot and the mic at the CC. The Comedy Cellar is also known as a place where up and comers along with legendary comics drop by regularly to do a set and work on their act. On any given night you might see Dave Chappelle, Dave Attell, Leslie Jones or Tracy Morgan try out fresh material. 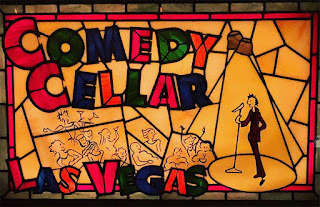 The Comedy Cellar recently opened a spot in Las Vegas on Flamingo Blvd at the Rio All Suites Hotel and Casino. The atmosphere has been designed to match much of the original Comedy Cellar, an intimate room with a small stage and a brick wall behind it just like it's namesake. Although unlike the original it's not actually in a cellar. The show format the Comedy Cellar uses most often is to have several comedians a night that go on for about 20 minutes each, sort of like a comedy relay team. Last night my sister Karen and I caught a show at our new desert Comedy Cellar. It started off with a host, in this case Mark Cohen who reminded me of Mark Linn-Baker in his Perfect Strangers days. Mark did a lot of audience banter starting with my sister and I, (that's what we get for sitting in the front row). After Mark was Mia Jackson who is six feet tall even in flat black leather sneakers and successfully contrasted her statuesque physical presence with a soft spoken delivery. I enjoyed her stories about adventures in eating. Next up was Brian Moses, who started off seeming to have almost nothing to say as if he was surprised to be on stage. We laughed though when he called Karen and I The Real Housewives of Reno. Brian did an intense set using the name LeBron James a lot. I'll leave it at that. The energy lightened up a bit with Jason Scoop who amused the house as he extolled the virtues of being ethnically ambiguous. Following Jason was Des Bishop, who looked like a cross between a Ken Doll and GQ model and was as hilarious as he was, (to use a vintage word), dashing. Matteo Lane finished us off with his take on the ridiculous intensity of cooking shows and his love/hate relationship with Starbucks. 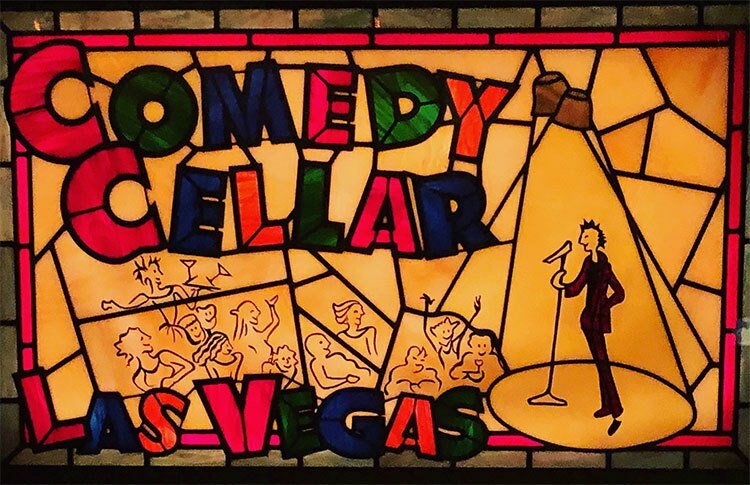 Here's hoping the Comedy Cellar has found a long term home here in Las Vegas.